Consuming corrosive water can cause health-related problems when it reacts with pipes containing lead or copper; metals from plumbing materials can mix with the water. Signs of metal in drinking water include bluish-green stains in sinks, metallic taste and small leaks in plumbing fixtures, according to the study. The study found the highest prevalence of corrosive water primarily in the Eastern and Southeastern U.S. states, including Alabama, Connecticut, Delaware, Georgia, Maine, Maryland, Massachusetts, New Hampshire, New Jersey, Rhode Island and South Carolina, as well as the District of Columbia. It is important for well owners to maintain and monitor the water quality of wells to ensure the safety of their drinking water. Click here to learn about EFS’ well monitoring and installation services. Other waste generating or construction activities. (5) Land Disposal Restriction (LDR) application. *Section 3, 4, and 5 from above are each discussed below and sections 1 and 2 are presented in “Understanding Complex Remediation Waste Issues – Part 1” in the October newsletter. USEPA, initially required that mixtures of listed hazardous waste and non-hazardous waste be managed as listed hazardous waste. Later, USEPA determined that when listed hazardous wastes mixed with media and no longer contained listed hazardous waste, the resulting waste could exit RCRA and not be considered listed hazardous waste. This exiting of RCRA is a Contained-In-Determination (CID). EPA hasn’t created any default numerical standards CIDs. The CID is referenced in the USEPA Document entitled “Management of Remediation Wastes Under RCRA,” EPA530-F-98-026. (4) Having IDEM regulatory concurrence. Once a contained-in-determination is provided, the soil must be managed as a solid waste or be relocated onsite once it is “generated.” For media located in states that don’t have USEPA CID certification approval, generators would need to apply to USEPA for CIDs. USEPA CIDs are site specific. A waste which has minimal levels of listed contaminants (less than LDR or IDEM CID Levels) but does not have a written CID issued by USEPA or an authorized state will need to manage the media as listed hazardous waste. It is important to note that the CID requirements do not apply to characteristic wastes. (2) The exemption or exclusion may be misunderstood, misread or misinterpreted. (1) The waste would only exceed the TCLP regulatory thresholds for USEPA waste codes D018-D043. If the waste exhibited ignitability (D001) or exceed the TCLP regulatory threshold for lead (D008), the media may not be considered for the exclusion. (2) If the petroleum contamination was the result of an above ground storage tank or tanker truck release (not subject to part 280), the media may not be considered for the exclusion. It is important to understand the exemptions and exclusions to ensure proper contaminated media management during remediation projects. 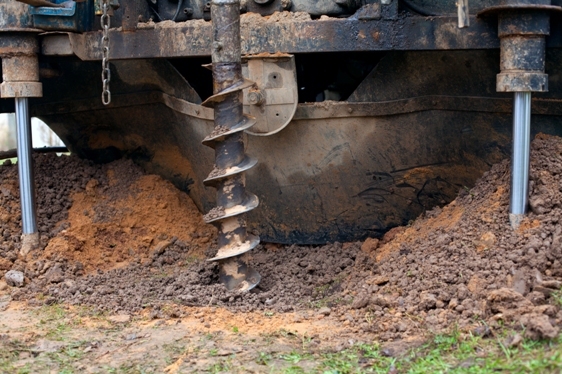 LDR remains an item that routinely creates confusion during soil removal projects. LDR basically establishes the level of contaminants that can be disposed in a land disposal facility. LDR has created confusion for both TCLP wastes and listed hazardous wastes. Each is discussed below. TCLP waste generators understood that exceeding TCLP thresholds put them in the hazardous waste management program. What they didn’t understand is why much lower numbers were required to exit. For example, the TCLP regulatory threshlold for lead is 5.0 mg/L. Less than 5.0 mg/L remains non-hazardous. The LDR is 0.75 mg/L. The soil treatment standard is 10 times the Universal Treatment Standard (10 x 0.75 = 7.5) or a 90% reduction. So if the waste never enters RCRA hazardous waste regulation at less than 5.0 mg/L, it may be disposed in a subtitle D land disposal site without treatment. But at or above 5.0 mg/L, it must be (1) treated to less than 7.5 mg/L by TCLP at a hazardous waste treatment facility. Additionally, any other Underlying Hazardous Constituents must be identified and treated prior to land disposal. For ignitable, reactive, or corrosive wastes, the underlying reason for the code must be removed. For listed wastes, this concept becomes more daunting for some. A generator cannot merely indicate a listing without knowing the concentrations of the listed waste. Listed hazardous waste residual disposal in a subtitle C land disposal site requires that the media meet LDR. LDR for contaminated soil is 10 times the numerical values presented in 40 CFR 268 or 90% reduction in concentration. Soil containing constituents less than 10 times the LDR levels can be directly land disposed in a subtitle C facility without further treatment. Soil containing greater than 10 times LDR will require treatment prior to subtitle C land disposal. Obviously, it becomes important to understand the LDR associated with each chemical in the contaminated media for proper and efficient media disposal. *Sections 1 and 2 from above are discussed below and sections 3, 4, and 5 will be posted in next week’s blog. First, be aware that the USEPA has indicated that environmental media contaminated with hazardous waste is itself not hazardous waste for waste determination purposes. Only when the soil is exhumed, is it considered generated for the purposes of 40 CFR 261. RCRA is a cradle to grave hazardous waste management system. 40 CFR 261 is RCRA’s heart because it establishes the thought process for determining if a solid waste is hazardous and if so it is subject to hazardous waste regulations. With this approach, generators (not their consultants, contractors, brokers or disposal facilities) are obligated to perform a waste characterization to determine if solid wastes are also hazardous waste. (2) utilize generator knowledge to determine the applicable waste codes. Why does this matter? USEPA has consistently indicated it is a generator’s responsibility to determine the generator status and all USEPA Hazardous Waste codes associated with the waste. Misapplication of codes can create issues with hazardous waste management, disposal (selecting a location permitted to accept the waste) and transportation. USEPA regulations have long maintained that if testing is used, generators are required to analyze representative samples of the waste to determine if it is RCRA hazardous waste or not. Representative sampling requires that it be representative “of the whole” of the waste being managed. Industrial process waste generators have a reasonable opportunity to conduct sampling on waste streams that vary minimally in concentration, matrix, etc. Limited sampling can be done with in-plant generated wastes. With soil remediation wastes, the waste concentrations vary at many points throughout a designated remediation area. For this reason, it becomes important to fully understand the remediation area and how the soil will be managed prior to analyzing samples per the Toxicity Characteristic Leaching Procedure (TCLP). Historically, some have thought that the existence of TCLP data from a single sample location mandates that all of the in place soil be managed according to that individual sample result. This may or may not be the case. A single in-place sample analyzed for TCLP characteristics does not necessarily mandate that the waste is managed as hazardous. TCLP information for in place soil is not completely consistent with the TCLP’s intent, because the soil in place (its designated use) is not yet a waste and therefore not yet a hazardous waste. TCLP requirements apply when a waste is generated. TCLP data for in place soil can be used to document the soil being hazardous waste, but is insufficient in determining Land Disposal Restriction (LDR) requirements as most LDR levels are either total concentrations or technology based. Knowledge regarding the likely TCLP levels and distribution (depth and radius from source) of contaminants throughout the media can be used to determine if site becomes a mass excavation, surgical excavation (based on waste code and LDR requirements) or if stockpiling is necessary to re-evaluate the waste following excavation or generation. It is also important to understand the role that investigation data can play in media waste determination. Investigation data can often be biased from the fact that environmental investigation regulations or guidelines are typically looking for extent of any contamination, source area/hot-spots (elevated levels), and clean levels (to determine extent). Many times, if a source area is known, the investigation will be extremely limited within the source area. Additionally, sampling depths may completely ignore some intervals of decreasing or increasing concentrations. And lastly, those performing the investigation may be only analyzing for specific parameters that do not include parameters needed to document whether the waste is a characteristic hazardous waste (TCLP exceedance) or a listed hazardous waste. Generator knowledge regarding contaminated media remediation projects is obviously difficult to document; especially if the generator is attempting to indicate that the waste meets certain LDR levels, indicate TCLP levels, or indicate other chemical data. Why do the actual concentrations matter? This information is critical in determining the disposal site selection and management techniques. An important factor in performing a waste determination using generator knowledge is that there may be more chemicals already existing in the environmental media than the generator has actual knowledge. For example, the removal of an underground storage tank and the associated diesel containing soil is regulated under 40 CFR 280 when soil removal is occurring. While the diesel impacted soil would be exempt from hazardous waste regulation, there could be mitigating factors such as a previous tank could have contained and released leaded fuels or a nearby dry cleaner could have previously contaminated the soil. In these situations, a “generator knowledge” based non-hazardous waste determination could be inaccurate. Many generators are confused when conducting waste determinations on waste where the source is unknown or undocumented. Determining a source is many times more difficult and typically requires more effort than obtaining TCLP sample results. An example would be a property owner conducting a contaminated soil removal at a dry cleaner site. The generator is required to make a waste determination and in so doing uncovers detectable levels of perchlorethylene in soil and groundwater. Perchloroethylene is a solvent stipulated in the USEPA listed waste codes F002 and U210 and it is also on the TCLP list as USEPA Waste Code D039. In “Management of Remediation Wastes Under RCRA”, USEPA indicated that a generator need not apply a hazardous waste listing if the source cannot be documented. The document has been perceived by many to be able to just say “I don’t know the source, so it’s not listed.” This statement is inaccurate. The document still requires the generator make a good faith effort to determine the source and concentration of the chemicals identified in the contaminated media. While industrial waste generators don’t generally have this issue with routine plant process wastes, it became a point of discussion in the contaminated media/remediation industry. The Proposed National Contingency Plan (NCP) preamble first indicated while the source is important information relevant to determining if wastes are listed, this information may not exist at CERCLA sites where USEPA was actively performing the clean-up. In an effort to maintain the clean-up progress and minimize potentially unnecessary costs, the determination could be limited to TCLP testing to determine only the characteristics (D codes). However, the document clearly references that a generator must make a good faith effort to determine the source of the waste. It remains a compliance issue subject to enforcement. This becomes increasingly important as listed hazardous waste is typically more expensive to dispose than characteristic hazardous waste and disposal site selection can become more limited with listed wastes. While a generator is narrowly focused on his/her waste determination, keep in mind that a hazardous waste disposal site operates per its hazardous waste permit. As such, the disposal site may not agree with the generators waste determination and not accept the waste media for disposal. Waste misrepresentation has resulted in many landfills needing to remove improperly characterized and disposed hazardous waste. If a generator intends to utilize the unknown source claim to avoid applying listings (F, K, P, U Codes), the generator should have sufficient investigation information into facility history, chemical purchases, waste disposal, materials used, etc. to document the good faith effort. EFS is Licensed to Drill in Several States. Is Yours on the List? Since the early 1990s, EFS’ drilling service area has completed work all over the Northern and Midwestern United States. EFS has since expanded its footprint to include many Southern states to its repertoire including Kentucky, Tennessee, West Virginia, Alabama, and Mississippi. In order to perform drilling work in any state, drillers are required to obtain their drilling license for each state where work will be performed. Joe Tillman, Driller in the EFS Alabama office, acquired his drilling license in the state of Louisiana, allowing EFS to expand our footprint even further. To learn more about EFS’ service areas, including drilling, click here! EFS was founded in 1994 with a Geoprobe® Direct Push Sampling System in order to support subsurface environmental investigation, remediation, and geotechnical evaluation by our clientele. Since the early 90s, EFS has expanded our inventory of equipment in order to provide soil, water, air, and waste sampling services throughout the United States. Our newest piece of equipment, appropriately nicknamed “Big Red”, is a CME 75 Drilling Rig mounted on a Morooka MST-1500 Carrier. 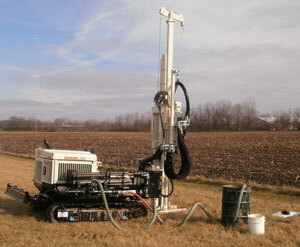 This rig has multiple attachments for a type of rock coring called wireline core drilling. Wireline core drilling is a special type of core drilling. Unlike some types of drilling, the purpose of core drilling isn’t to make a hole, but instead to retrieve a core sample, a long solid cylinder of rock that geologists can analyze to determine the composition of rock under the ground. While performing core drilling, the rig is capable of reaching depths of more than 1,000 feet below the ground surface. The 72 inch stroke, hydraulic vertical drive system has no chains or cables which can stretch and an emergency spindle brake can stop rotation in less than a revolution, allowing workers to operate the rig much more safely. The rig has a small, high-speed winchline that is capable of retrieving the inner barrel very quickly. It also has a break-out table and break-out wrench that is made to hold Nq rods and even unscrews them! EFS’s newest addition allows us to reach further, digging deeper under the ground’s surface, and to break through heavier, more condensed ground material to provide high-quality core sampling for our clientele. EFS Drilling Services Licensed in Several US States. Is Yours on the List? Since the early 1990s, EFS’ drilling service area has completed work all over the Northern and Midwestern United States. EFS has since expanded its footprint to include many Southern states to its repertoire including Kentucky, Tennessee, West Virginia, Alabama, and Mississippi. In order to perform drilling work in any state, drillers are required to obtain their drilling license for each state where work will be performed. Joe Tillman, Driller in the EFS Alabama office, recently acquired his drilling license in the state of Louisiana, allowing EFS to expand our footprint even further. EFS was contracted to perform direct push technology (DPT) soil and groundwater sampling services at the Naval Surface Warfare Center (NSWC) in Crane, Indiana. The project was performed under Comprehensive Long-Term Environmental Action Navy (Clean) contract. The NSWC in Crane, Indiana is currently undergoing environmental investigation and restoration activities. Preparing a site specific Health and Safety Plan. Collecting soil samples at 115 locations to a depth of 10-20 feet below grade at two Areas of Concern (AOCs) utilizing a DT-6610 track-mounted direct push sampling rig in UXO-cleared areas. Abandoning each boring locations with bentonite chips to surface grade. Collecting groundwater samples to 19 boring locations utilizing a stainless steel sampling screen attached to the DT-6610 DPT probe drive roads or a temporary one-inch PVC piezometer installed at the boring location. On-site management of all drill cutting and decontamination rinse water. EFS provided Occupational Safety and Health Administration (OSHA) 40-Hour HAZWOPER-trained personnel and an EFS owned DPT drill rig and sampling tools to accomplish the scope the work. All work activities were performed in accordance with OSHA, U.S. Navy and the Indiana Department of Environmental Management (IDEM) regulations. The project was performed on schedule and under budget within a four week period. EFS was contracted to perform direct push technology (DPT) soil sampling and monitoring well installation services at 26 sites located along the I-465 corridor on the west side of Indianapolis, Indiana. The project was performed under Indiana Department of Transportation (INDOT) Construction, Engineering and Inspection (CEI) services contract. EFS provided Occupational Safety and Health Administration (OSHA) 40-hour HAZWOPER-trained personnel and EFS-owned DPT and HSA drill rigs to accomplish the scope of work. All work activities were performed in accordance with OSHA, INDOT, Indiana Department of Environmental Management (IDEM) and the City of Indianapolis regulations. The project was performed on schedule and under budget within a four month period. EFS has the equipment and expertise to provide soil, water, air and waste sampling services throughout the United States. Our staff has experience sampling soil and groundwater at the following types of sites: leaking underground storage tank (LUST); Resource Conservation and Recovery Act (RCRA); Comprehensive Environmental Response, Compensation and Liability Act (CERCLA); and Toxic Substances Control Act (TSCA). In addition, EFS has the personnel and equipment to provide air monitoring as well as hazardous and nonhazardous solid, liquid and sludge sampling services. Environmental Field Services, (EFS) will provide performance based environmental soil and groundwater investigation services at Redstone Arsenal in Madison County, Alabama. EFS was recently hired by Shaw Environmental & Infrastructure (Shaw) to install up to 546 DPT soil borings and 140 overburden monitoring wells as part of this massive sampling project. The scope of work, which also includes subsurface soil, surface water/sediment, and groundwater sampling, is part of Shaw’s Performance Management Contract with the U.S. Army Environmental Command to investigate and remediate over 300 Solid Waste Management Units at Redstone Arsenal. EFS will support the project with a team of up to 6 onsite personnel for a period of 14 to 15 months.